Andrea Petkovic saved three match points and prevailed in a third set tiebreak for her first ever win over Belinda Bencic, 6-3 2-6 7-6(8). This was a good match and there was barely anything to separate the pair as the scoreline suggests. Petkovic had led 4-2 in the third set and with break points before a resurgent, Bencic found her game, and most importantly her serve, in the nick of time. Bencic came within two points of match. Petkovic held on for the tiebreak. Bencic had three match points – Bencic’s issues on serves (she hit 12 double faults) came back late on in the tiebreak as she double faulted on her first match point at *6-5 and her second serve got the treatment on the third as Petkovic swatted away a return winner. The second match point was just too good from Petkovic as she opened up the court and trusted her backhand with a winner down-the-line. All in all, it felt like Petkovic was a touch steadier in this match. It’s good to see Bencic back playing and with seemingly no health issues. She definitely seems to be more aggressive these days and was often looking to come forward. This was with mixed success! The serve remains a bit of a liability in the key moments. Bencic had her petulant moments during the first two sets, but then seemed to really focus late on in the third set. She was even smiling on occasion when Petkovic won a few points. Petkovic is into her first WTA semi-final since Washington last year! After a thrilling deciding tiebreak, @andreapetkovic defeats Belinda Bencic 6-3, 2-6, 7-6(8)! It’s been a turbulent week in D.C. with the weather as Bencic-Petkovic was the only quarter-final to finish. Svetlana Kuznetsova leads Yulia Putintseva, 6-2 2-2, while Vekic has an early break in the first set on Magda Linette. The weather looks better on Saturday and Sunday so hopefully they should catch up. Still, it’s not an ideal situation with players having to play two matches in one day. Elise Mertens is into her fifth semi-final of the year after a 7-6(4) 6-3 win over Johanna Konta. This was one of the most impressive displays i’ve seen from Mertens as she came back from 2-5 down in the first set against a Peak Konta. Konta looked in sensational form early doors as she used her serve effectively, was going after her shots and finding the lines. Mertens’s coach, Dieter Kindlmann, came on and reiterated that Konta was playing well and that her chance would come. Coach was right as Konta played a poor game serving for the set at *5-3. Mertens took her opportunity and then relied on her serve to save two set points to get back to 5-5. I was so impressed with Mertens’s patience and she never panicked. She seemed to back herself entirely as she worked her way into the match. After winning the first set, Mertens played some brilliant tennis in the second set as she went for the winners down-the-line and it paid off. Mertens has such a solid game and there is no real weakness. She’s had the odd wobble in matches this year but generally, I think that mentally she is very grounded and secure. Next up for Mertens in the semi-finals is Mihaela Buzarnescu. Mertens leads the H2H, 3-0 and won their last match in Hobart at the start of the year, 6-1 4-6 6-3. I’d go for Mertens in this one after watching how she handled Konta. Buzarnescu keeps on winning, but i’m concerned by how much tennis she has played over the past few months and whether she may burn out at some point. Danielle Collins was third into the semi-finals of San Jose after Victoria Azarenka was forced to retire with a back injury. Collins was leading 3-0 in the second set after Azarenka had taken the first set on the tiebreak. It was horrible to watch at the end as Azarenka was clearly in a lot of pain and very emotional. It was such a shame because Azarenka had looked in stunning form in her second round win over Anna Blinkova. It seems unlikely that she will be fit for Montreal next week. Maria Sakkari is having a great week in San Jose and scored her fourth top 20 win of the year with a 6-4 7-6(2) triumph over Venus Williams. Sakkari came from a break down in both sets and saved two set points in the second set. Sakkari looked slightly overrawed by Williams’s pace early on. The Greek player soon found her range to reel off five games in a row and serve out the opener to love. The second set was closely contested and half of the games in the second set went to deuce. Williams increasingly looked to be aggressive and come forward. Williams served for the second set at *5-3 where she was broken to love. I was very impressed with Sakkari’s mentality and she always stayed in touch. Sakkari was unable to serve out the match, but rather danced through the ensuing tiebreak. Williams’s intensity dropped at the end and there were just too many errors. This was an excellent win for Sakkari as Williams, while not having a great year, is always a difficult player to put away. I’ve grown fond of Sakkari’s game this year. Her groundstrokes are well balanced – she’s a solid hitter, can move and defend well, and also has some power in her locker. Her serve, notably the second serve, has held up particularly well this week. I’m surprised that this is only Sakkari’s second semi-final of the year. It feels like she has had a more successful year, yet hasn’t really managed to drive the momentum at one tournament. The main draw for Montreal was released on Friday night and it’s a cracker! So many highlights in this one that I don’t know where to start. The qualifying draw is not bad either with the likes of Carla Suárez Navarro, Lucie Safarova and Sam Stosur all present. I’m thrilled to see Rebecca Marino get a qualifying wild card where she will play Vera Lapko in the first round. Bizarre to see Lucie in qualifying for Montreal. Via Tennis Abstract, the first time since 2009! Plays Katherine Sebov in QR1 and then potentially Brady/Cepede Royg in QR2. And finally, let’s end on an uplifting note. Keep going, Timea! Tears of joy, after yesterday’s win… 13 long months of wait, doubts, anger, hard work, sacrifices, support, dedication, pain, injuries,patience and much more. 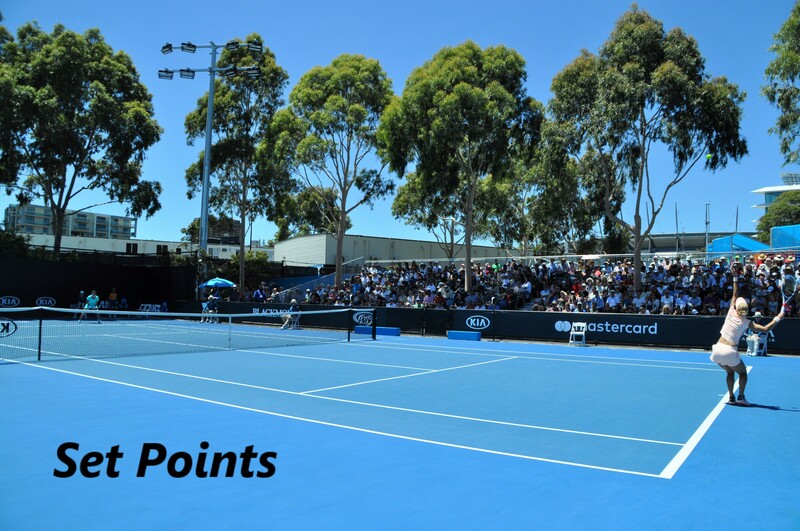 August 4, 2018 in San Jose, Set Points, Washington, WTA. On Sakkari instagram site Sakkattack7, linked above,she is shown pumping some very heavy iron. The finals for Washington and San Jose start at the same time tomorrow, in spite of there being 3 time zones apart. Makes no sense. Yeah it’s mad, was the same last year with Stanford too. They are a bit late for me anyway! Svetaaaa! Where has this week come from?! Yes! and she has swept through the draw too. I felt like she was due a good run. I watched some of her matches on grass and didn’t think she was playing badly at all, just needed a break. Hmm yes that could be interesting. Buzarnescu’s had a heavy week in San Jose so wonder how she would be physically if they do in fact meet in R2. Of all the surfaces (as they played on clay and grass), I think i’d favour Svitolina most on the hard courts. Yes true. And Buzarnescu will be super confident. I’d expect Buz to d. Wang Qiang in R1 of Montreal but we shall see.